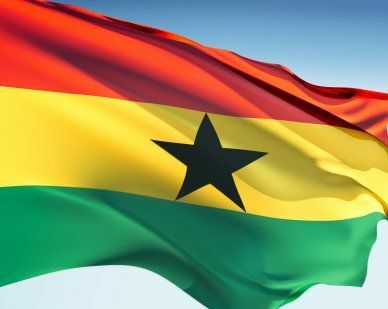 This flag was designed by Mrs. Theodosia Okoh in 1957, when Ghana became independent. It has three horizontal stripes: red at the top, yellow in the center and green on the bottom. In the center of the yellow stripe is a black star. From 1964-1966 the yellow stripe was replaced with a white stripe. In 1966 the yellow stripe was reinstated. Red stands for the people’s blood sacrificed in the war of independence. Gold is symbolic of mineral wealth and green is representative of the forests and natural resources of the country. The black star represents freedom. Our top-quality Ghana flags conform to all official specifications. Emblems and designs are executed with the highest possible degree of accuracy in regard to detail, color shades, placement and proportion to flag size.